Chris Warren survived what he called the “toughest pair in the house” to defeat Norm Duke and win the 2018 USBC Senior Masters title. 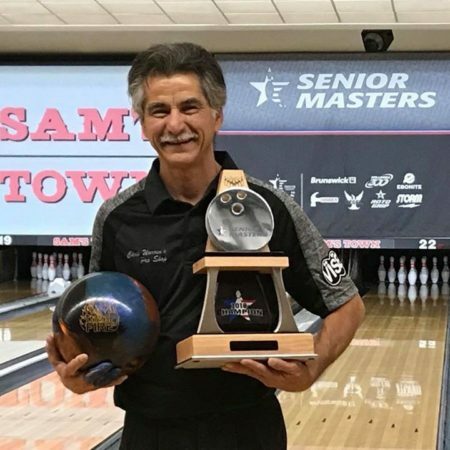 According to the USBC Press Release, he’s the third bowler in history to win both the USBC Masters and the Senior Masters. In the stepladder final, which aired on BowlTV, he told our field correspondent, Tony Rodriguez Jr., that he started with a Roto Grip Hustle Ink sanded to 800 and went to an Intense Fire sanded at 2000. See his interview here. Warren, the fourth seed in the tournament had to climb the ladder to win the title. In his first match he defeated Ron Mohr, 236 to 217. He moved on to defeat Kieth Lesko, 234 to 168 and Michael Haugen Jr. 290 to 197. In the final match, he would have to defeat the tournament leader, Duke, twice to win the title. He won the first game 269 to 220. The second game came down to the tenth frame. Duke needed a strike and get at least eight pins with a spare in his tenth frame to win the match. He threw the first strike but then left 3-4-6-7-9-10. Warren won 246-241. 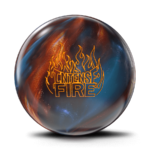 The all-new Intense Fire was a favorite in several of the PBA50 players bags last week at the Senior Masters. You can watch a video here. The Intense Fire is available in your local Storm VIP Pro Shop this Friday, June 15. Learn more about the latest technology here. For a chance to win a new Intense Fire check out our #FanTheFlames contest by visiting stormintensefire.com through July 8.